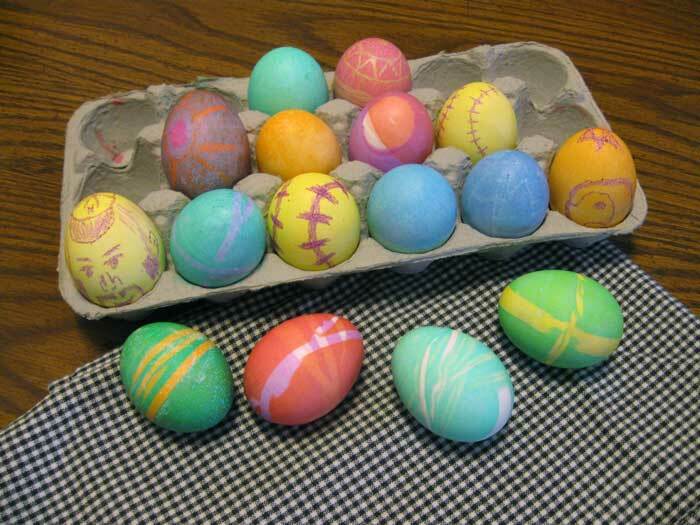 This Easter, we got even more creative with the Easter egg dying. Actually, my DH had read about a resist dying technique (aka Shibori) in the newspaper recently and retrieved various rubber bands from the junk drawer to experiment. So, in addition to the standard baseball eggs (third row, far right, yellow egg) and the baseball player (second row far left), there were Shibori resist dyed eggs. 4) green/yellow: yellow dyed, then rubber band wrapped with a wide and narrow band and overdyed in green. He also experimented with a plastic netting that produced a modest resist with a subtle speckled effect. A few solid colored eggs, eggs with hand drawn designs in crayon (wax resist method) and a few chocolate eggs rounded out this year's Easter basket. Thanks, Easter Bunny!